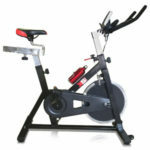 Does The Compact Medicarn Aerobic Bike Training Cycle Provide The Tough Cycling Session Required? 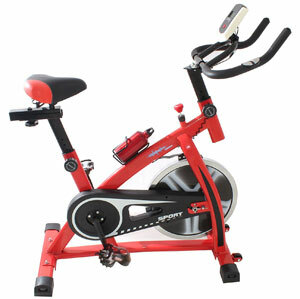 The Medicarn Aerobic Bike Training Cycle is an interesting exercise bike for anyone that is into spinning and home fitness. It is designed to offer a tough cardio workout thanks to the different features and adaptations and is classed as both a home exercise bike and spinning machine. It is also a good looking model with the black and red frame. In many ways, this seems to be a pretty standard bike of this class, with the components, design and function. Is there anything about this bike that makes it stand out, or is this just more of the same? 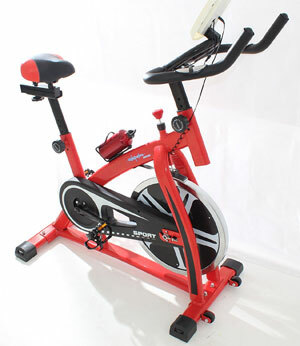 What advantages have stood out for buyers when testing this Medicarn Aerobic Spinning Bike at home? Looking at that idea of a good cardio workout, this model has a decent 15kg flywheel with variable resistance settings to help users progress through different intensities. There seems to be the opportunity to really push hard with this model and to slow things down when needed. Interesting additional elements here include the use of the double direction pedals and emergency stop for extra security. All of the progress made during these sessions, however tough or gentle, can be seen on the digital display of the console. This mostly offers basic data on time, speed, distances and calories burned, but there seem to be no real complaints over accuracy. The other selling point here is that this is a compact model too. The base is only 101cm long. At the same time, it is pretty adjustable. The height of the handlebars is adjustable from 101-116 cm, the seat from 82-92 cm from the floor and users can change the distance between the seat and handlebars too. This means more options for more users. Furthermore, there is nice construction on these adjustable parts and it is pretty easy to set up, despite the poor instructions. 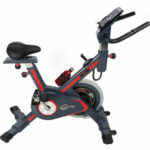 Are there any disadvantages to this Medicarn Aerobic Bike 15kg Training Cycle being mentioned in user reviews? 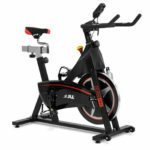 There are plenty of positive reviews about the quality of the bike and the workout achieved, and few issues. It is a little bit heavy for some, but for others this means a sturdy bike that can take some punishment. The padded seat not quite padded enough for some, but this isn’t much of a surprise as many exercise bikes are like this. Some have bought an addition gel cover to make things a little easier. Other than that, and the aforementioned issue with the instructions, the feedback is pretty good. Summary: does the positivity here mean that it is easy to recommend this Medicarn Training Cycle? In the end, it seems that there is more to this bike than some may have expected due to the intensity, construction and results offered. There are some great opportunities for those that want to replicate the intensity of their spin class at home, with more options and a tougher challenge than expected. In addition to this, it fits nicely into a home gym for accessibility and ease of use. The Medicarn exercise bike is attractive and compact, but it is also strong, adjustable and reliable.